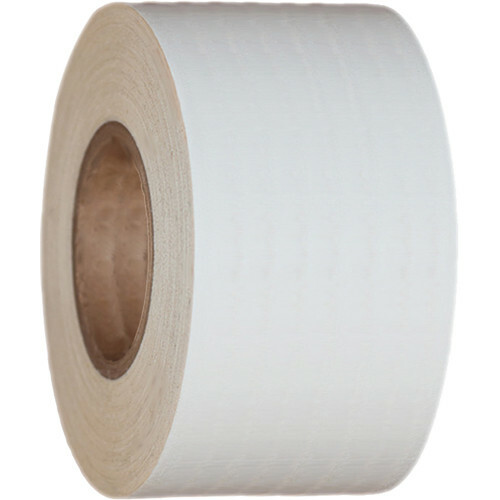 This roll of White Gaffer Tape from Devek measures 4" by 30 yards and is designed with convenience in mind. Made of durable vinyl-coated cloth with a high tensile strength, this tape can be easily hand-torn and comes in a matte finish that does not gleam under light. Its high-tack adhesive coating allows it to be easily attached to most smooth surfaces, and avoids leaving a messy white residue when removed. Gaffer tape is used primarily for theater, musical venues, and film production, and is an essential tool for any professional lighting technician. Box Dimensions (LxWxH) 5.8 x 5.2 x 3.5"
Gaffer Tape (4" x 30 yd, White) is rated 3.5 out of 5 by 2. Rated 2 out of 5 by Anthony from Doesn't stick! I have used this tape on plastic, felt, aluminum, and several other surfaces, and I am having to press the tape back down on a daily basis. This is in an air conditioned studio, so temperature and humidity are not an issue. I would not purchase this product again. Rated 5 out of 5 by Anonymous from BEST TAPE EVER!!!!! We use this tape for a semi-permanent placement on a cement floor in an out-of-the-way area. I have no doubt it will do the job - blows duct tape out of the water! Great product!